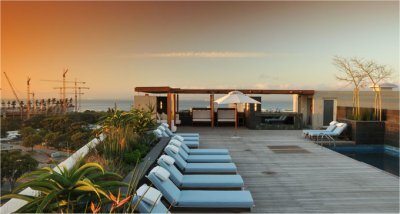 Set against the iconic outline of Table Mountain, with panoramic views of Cape Town and the Atlantic Ocean, the Cape Royale Luxury Hotel and Residence pairs the familiarity and sophistication of Europe with the vibrant spirit of Africa. 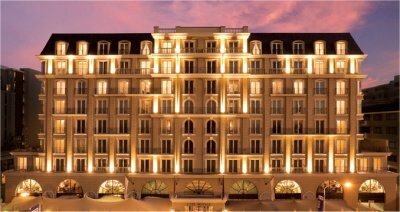 From the stately entrance to the relaxed atmosphere of the designer-furnished suites, this five-star Cape Town luxury accommodation provides an enclave of exclusivity and refinement in the heart of South Africa’s most beautiful city. All 95 suites feature magnificent views of the waterfront and mountain, as well as contemporary décor, custom furniture, and carefully selected artwork. The hotel’s signature restaurant, 1800°, prides itself on exceptional service and masterful preparation, while the tranquil Equinox Spa and full business center make these luxury Cape Town accommodations the ultimate destination for discerning business or leisure travelers. Offer is based on a Single or Double Occupancy in a Deluxe Suite with Queen Bed. Tax and service charges of $49.oo additional per room per night.